I’m a great fan of logic. My highest scores on the GRE and other standardized tests were always in the “analytical thinking” category. Nevertheless, I agree with Cousteau that life would be bleak indeed if we were bound by the limits of our own reasoning, which is often flawed or incomplete. This is not to imply that faith and hope are exclusive of reason; it simply means that logic will only take us so far. In times of sorrow or despair, I’ve found that logic often reinforces my grief, especially when there are overwhelming and unavoidable circumstances playing havoc with my soul. At such times, faith and hope become essential to survival. Beyond mere survival, however, faith and hope provide the energy and incentive to keep moving forward through an uncertain future. As Cousteau suggests, these qualities have enabled progress throughout human history, and will continue to be indispensable. If you are facing difficulties or sorrows today, I wish you the faith and hope to look beyond the bleak realities that trouble you, and to believe that better days lie ahead. Reach out for the prayers and encouragement of others, here or elsewhere, and offer your support to people you know who may be struggling. Together, we can overcome. Sheila, I have been thinking of you so much. Jeff’s aunt, who is one of my closest friends, lost her dog this morning. He died peacefully in his sleep, which she had prayed for when his time came. She had him for nearly 17 years and since she has always been single, her two dogs are her family. I have been praying for both of you and hope that the grief you feel is balanced by the overwhelming joy and gratitude we feel for our four-legged family members. I do think they will continue to bless our lives even after they are no longer present with us physically. Jeff’s recovery from the second surgery continues to be much slower than we had hoped for. Thanks for your continued prayers. They are starting him on some liquids today. I know he must be getting so tired and discouraged. I too felt that today’s post was perfect for me today. Thanks for being here! Julia, I think in the process of recovery, it is so easy to become weary. As you have shared here, Jeff has continued his daily routines, through treatments and various procedures. Keep fighting,Jeff! We share a pride in our husbands; I’m sure of that. As I read about your aunt’s dog, I am so glad for the “going to sleep” which eliminates the decision making. May she be comforted by the dog (companion) that she still has. Hi Sheila, I appreciate your words of encouragement! I have been thinking of you, and hope that your memories of Salty are bringing you comfort. I dread facing that very difficult decision with Pasha, but everyone who has been there has assured me we will know when it is time. Meanwhile I am just thankful for every day with him. Jeff seems better today and his voice sounds less tired and more hopeful. I know you have experienced the bittersweet pride of watching a very strong husband enduring suffering and keeping a “stiff upper lip” as the saying goes. I think the hardest part for Jeff is having to DO NOTHING when he is the type who always has to keep busy. We’ll keep praying for each other during this season of heartache, and YES, trusting in God makes all the difference! Thanks for being here! 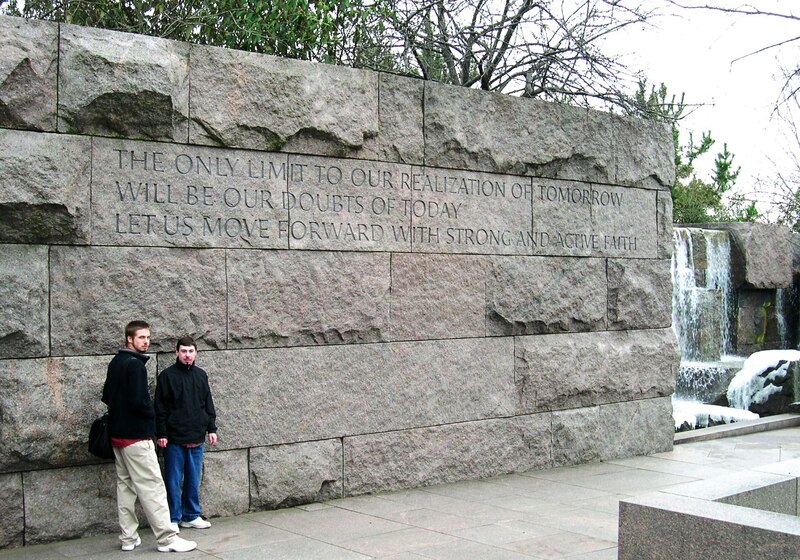 I love this monument and what a great photo of your boys. I agree that logic often is a hindrance in fighting despair. My Aaron is so logical that it often interferes in his search for faith but he is always overcome by beauty or the unexplained all around us. I have hope and faith that Jeff will beat this and I am encouraged by the good news you send our way. Thank you for sharing this. You’re welcome, Amy. It’s really strange how I schedule these posts in advance, yet they often bring me thoughts that I need to hear on any given day. This is one I needed to read today as Jeff’s recovery from the second surgery seems an endless series of two steps forward, one step back. Faith and hope stay with us! You have been taking every step of the journey with us since that first night in September when we got the horrible diagnosis, and you and Stephen came to stay with Matt while I rushed to the hospital in the dark. You have been with me during so many tough times and I thank God for your friendship! Keep us on the “can come at a moment’s notice list” and please let us know when and what you might need. Rides, meals, company anything at all. I have felt so powerless through this. Praying that each day brings Jeff closer to coming home. I share regular updates with Mr. Button and his sweet wife. He always tells me he will call Maggie too but that he is certain you have either talked with her or somehow used ESP to let her know what is going on. 🙂 Anyhow, I just want you to know you are never far from our thoughts and prayers. Amy, thanks so much. I know I can call on you as I have before. Thanks for sharing the info with David & Beverly. Maggie stays in touch and I believe she knows most of what is going on via my online updates. Keep us in your prayers. Jeff seems a bit better today and said that the drainage from the incision (now that they have removed the drainage tubes) is a little bit less. Also, the doctor said the x-rays looked somewhat better. They are starting him on “Boost” which he hates but it’s a step forward from just clear liquids. We’ll keep you posted. this is a beautiful post and so appropriate for this holiday. i love the image. i don’t think anyone understands the impact of that wall until they experience it in person. Thanks, Z – I am glad you like it. I had the same experience with the wall; the design of it sounded stark and unappealing until I visited in person. It’s pretty overwhelming to think there is an entire, complex life behind each of those names. We hear these huge numbers and have no concept what they represent. The Wall brings the numbers into focus. It’s staggering. I appreciate your visits here! Julia, thanks for sharing this picture. Very apporiate today. Glad to hear Jeff is feeling a little better. Hopefully no steps back. But if so, then another step forward. I read your UR post this morning. Hope Matt continues to do well, also. Thanks so much, Jeff is better today and if he continues to improve, he might get to go home on Wednesday. We really appreciate your thoughts and prayers – thanks for being here! Yeahhh! happy for you & Jeff. Thanks Merry – I guess I spoke too soon; another setback today, but we’ll keep the prayers going up. Thanks for being here! Thanks so much. Things are discouraging right now but we’re still hoping and praying he will get better. Three surgeries in two weeks is a lot for anyone, but really hard on someone who’s coming off so many months of chemo.